Whisk eggs in bowl. Place bowl over pot with boiling water, acting as a double boiler. Continue whisking eggs, and cook to desired doneness. Finish with crème fraîche and chives, season to taste with salt and pepper. Clean mushrooms thoroughly in water, drain. Cut morels into halves or quarters, or leave whole, depending on size of mushroom. Sweat shallots in butter, add mushrooms and sauté for couple minutes. Season to taste with salt and pepper. 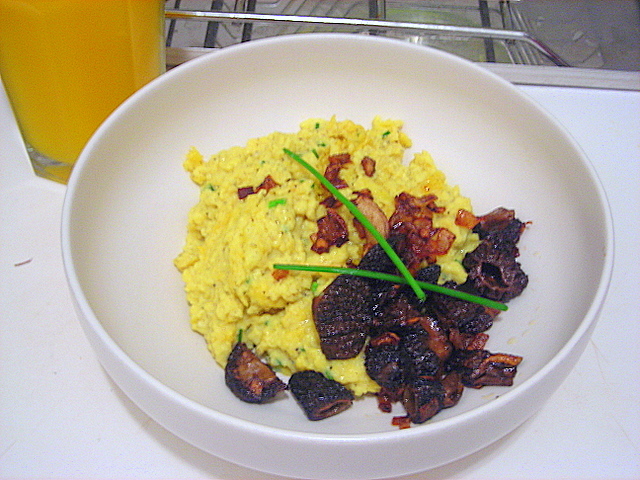 Plate eggs and morels, garnish with chives. Serve at once. 15 Jun	This entry was published on June 15, 2008 at 9:30 am and is filed under food, general. Bookmark the permalink. Follow any comments here with the RSS feed for this post. I thought those mushrooms were more pork. I still haven’t gotten over your BBQ extravaganza. No mushrooms for me, thanks. How come your eggs are so yellow? The eggs are fresh chicken eggs from Quattro Game Farm in Pleasant Valley, New York. Yolks are brighter than normal supermarket eggs, and the flavor is markedly different. It’s like night and day. One dozen eggs goes for $3.50. What does “sweat shallots” mean?